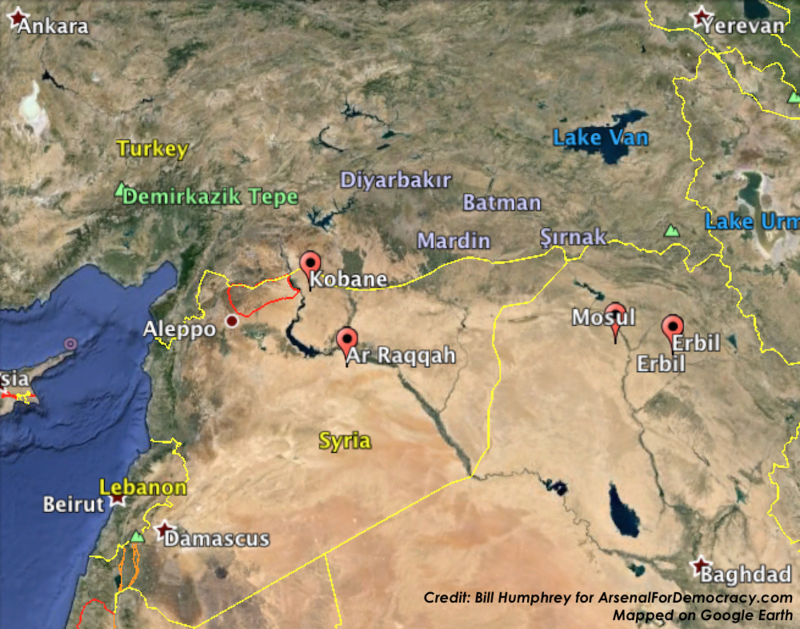 Home » Commentary » Arsenal Pulse » A new Syria “red line”: No Kurds in the Turkish-backed zone? A new Syria “red line”: No Kurds in the Turkish-backed zone? Regional View: July 24, 2015 map estimation of the perimeter of a potential Turkish occupation zone and U.S. no-fly zone in northern Syria. Enlarge Image. The U.S. and Turkey have reached an understanding meant to assure the Ankara government that plans to drive Islamic State militants from a proposed safe zone in northern Syria won’t clear the way for Kurdish fighters to move in. However, [YPG leaders] said they had made no commitment not to cross the Euphrates. Preventing Kurdish forces from taking advantage of U.S. and Turkish airstrikes in the area is “red line” for Turkey as it steps up to play a greater role in battling Islamic State, a Turkish official said Monday. The United States promptly denied this report. However, the New York Times is still backing up the Wall Street Journal’s version as late as today. The Turkish deal with the United States sets up an “ISIS-free” bombardment zone along a 60-mile strip of the border region that features another exclusion: At Turkey’s request, it is also explicitly a zone free of the Kurdish militia, even though the Kurds had begun advancing toward the area to start battling the Islamic State there. Despite cooperating with American forces for months, the Syrian Kurds are now starting to worry that their success might not outweigh Turkey’s importance to the United States. I’m sorry, but if these reports of a rule excluding Kurdish fighters are actually true, this is bad policymaking. Pure impulse and incoherent nonsense. It has little strategic foresight or unifying logic, and it’s probably tactically unenforceable at best. As we argued in our recent op-ed in The Globalist, to recruit Turkey against ISIS, the United States lost sight of its true friends (the actually effective anti-ISIS — and non-salafist — Kurdish militant groups). This scattershot obsession with the crises of the moment has destroyed any U.S. attempts to form a coherent policy for Syria (or Iraq). We just flail aimlessly from one thing to the next — reacting, reacting, reacting. Tagged Kurdistan, Middle East, Syria, Syrian Kurdistan, Turkey, United States military.